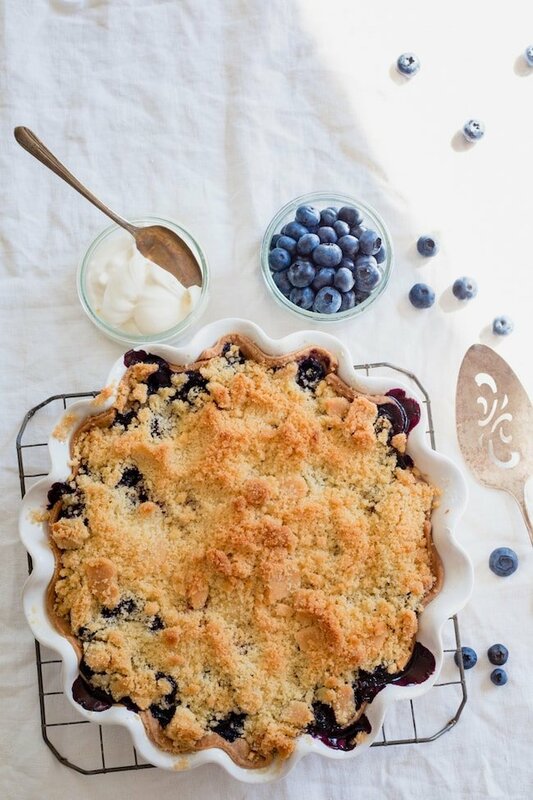 Blueberry Pie with Crumble Topping is a favorite summer dessert! Serve with a scoop of vanilla ice cream or A dollop of whipped cream for the ultimate pie experience! I had a ton of blueberries to use up and wanted to make a blueberry pie. If you know me, you know that is strange because I don’t usually like to make pies. I just thought the blueberries belonged in a pie and I wanted to make them happy…and blueberry pie did sound pretty tasty. So I asked around for the BEST blueberry pie recipe and my friend Danielle came to the rescue. I met Danielle at a Kroger event this year and we were instant BFFs. She is the most hilarious person ever, if you follow her on Instagram stories, you know what I am talking about. If you don’t follow her, you need to ASAP! She is also a culinary genius and an entertaining extraordinaire! I remember her telling me that she loves to make pies so I messaged her and asked her if she had an amazing blueberry pie recipe and she responded with a big fat YES! And luckily, she was willing to share the recipe with me…and all of you! You guys are going to go crazy for this Blueberry Pie recipe. It is perfection!